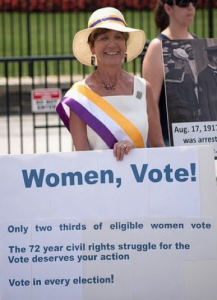 On the 100th anniversary of her suffragist grandmother’s arrest at the White House, Patricia McDonald demonstrated at the same location to commemorate the first civil rights campaign of the 20th century and call attention to the importance of voting. McDonald called for greater voter turnout by women and spoke against any efforts to suppress or erode voter turnout. During her tribute, Patricia McDonald told spectators of her grandmother’s participation in the National Woman’s Party protests. She also said, “I encourage everyone, all women, to get out and vote. I also ask you to donate to the Turning Point Suffragist Memorial.” Funds are being raised to build a national memorial on land that was part of the Occoquan prison complex in suburban Virginia where the suffragists were held and frequently endured tortuous treatment. McDonald also noted that if other descendants contact the (Turning Point Suffragist Memorial) Association they will enhance a treasury of suffrage stories that will be protected and shared as part of the memorial’s educational mission. 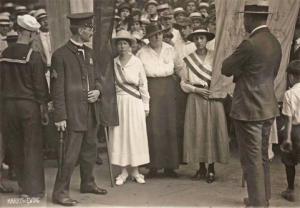 The TPSMA maintains accounts on descendants and relatives to preserve their sacrifices and to enrich the historic impact of the fight to win the vote for all women. On August 17, 1917, McDonald’s grandmother, suffragist Catherine Flanagan, participated in the ongoing campaign to win voting rights for women. The 26-year-old was one of the Silent Sentinels — women who were silently picketing the White House calling for President Woodrow Wilson to support a constitutional amendment granting women the right the vote. Their banners targeted President Wilson’s speeches which expressed support for democracy in Europe but made no mention of equality for women on the home front. Some felt the suffragists were guilty of treason for protesting as the United States was entering World War I.
Flanagan’s arrest followed several days of crowd violence against the demonstrating women suffragists, which involved at least one pistol shot. The picketing had been going on for months. Police officers were ordered to arrest the women demonstrators rather than the offending crowd, which emboldened the spectators and resulted in more violence against the suffragists. Flanagan was among the women sentenced to 30 or 60 days at the D-C prison system’s Occoquan Workhouse.